I install every game to my 360 before I even play them...Reach was no exception. In the disc drive, install, then play. To try and keep my 360 alive as long as possible, you see. Hell, even if it DID work like Halo 3, with installations INCREASING the load times, I'd still install it. Good to know. I actually hadn't thought about it yet- there's almost no loading if you're playing the campaign straight through. I'd have installed it anyway. Keeps things quiet and lets the DVD drive live longer. I'm just waiting for when Sony wakes up and lets us do a full install on the PS3. Sure it might take longer if some of the games actually start filling a blu-ray disc, but come on, we can get 320GB drives to slap in there for such a small price that there's no reason to not include the option. I always install my games into my HDD. So far I know, Halo 3 is the exception. But so far almost anyone knows, I own but never play the game. Got it with ODST. But yeah, Mass Effect 2 would be an infuriating experience without the install feature. But Ouch to you poor suckers with the 360 slim. Shoulda forked over the money for the Harddrive version of your 360. Why is this news? I mean, i'm looking forward to getting the game as much as anyone but why is this news? The Escapist doesn't do it for other games. Cause halo 3 was wonky in that it took longer and this game is insanely popular and different from 3. I'm sure lots would be interested as compared to wondering if R.U.S.E. or something loads faster lol. My friend and I were playing Reach on his TV (120 Hz, and so crystal clear) and noticed that the background would lag a bit from time to time so he installed it on his HD and noticed the whole game ran smoother. I guess Reach is working out Xboxes harder. 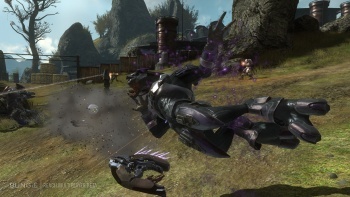 Halo 3 used the Xbox 360 hard drive as a cache, thus speed up loads. The problem was that this was does before the installation feature, and the game would still try to do it even if the game was already on the hard drive. This meant that installing Halo 3 would actually increase your load times. This is just letting everyone know that Reach doesn't suffer from the same problem. Was the benefit that great? I wanted to, but at the time I was playing ME2, I had a pathetically small drive and was waiting on a new one. One of these days I'll go back through the game, and I was always wondering what the difference would be with an install. Why is this news ... The Escapist doesn't do it for other games. I think this game shows one of the biggest differences between an install and without. That's quite interesting. For me, it was. You see, Mass Effect II loads EVERYTHING and then allows you to explore your hub and such. Mass Effecf I gave you LESS loading time [ As in watching the same screen over and over ] so you could jump right in, sure, it kept loading textures but it was a smooth experience regardless. Some stutter did happen. Install the game into your HDD, saves alot of grinding your teeth. ...That is...wow, alot. Talk about taking up HUGE space...I thought we were moving in the other direction? Same here. I need to lessen the strain on the disk tray as much as possible. It's going to fail one of these days, but I want that day as far away as possible. What direction would that be? Games have always been steadily increasing in size. But Would This Happen On PS3? No, because the PS3 doesn't have the optional install feature in the first place. Just googled this question and this was the first hit. Should have checked good old escapist first before I went elsewhere. OT: Good thing I have another 50 GB free on my hard drive. Bad thing I dont have any money left to buy Reach. How do you install games exactly? Ahem, good to see that. Good thing I me like 190gb of free space. Considering the notoriety of the 360's hardware failure, I make sure that data is installed where possible to reduce strain on the console. EDIT: Yes I know the list is severely outdated but it should give you an idea of what to expect in terms of performance gains. I've never installed a game to my xbox...never even knew there were benefits. I don't know it there is a point to for Reach, since it seems to run just fine for me. But if it reduces loading times ME2 would be amazing if I installed it. I mean its not going to kill me to wait an extra 10 seconds or something, but at the same time ME2 had way too many loading screens. Is it really that hard to wait thirty seconds? No, Microsoft here, want to wringle as many shiney coins as possible. OT: Maybe another reason to buy it, my taster yesterday was very impressive, yet 7GB is a bit much isn't it? Looks like my 20GB will no longer cut it, upgrade time! Damn... I only have like 2MB left in my hard drive.